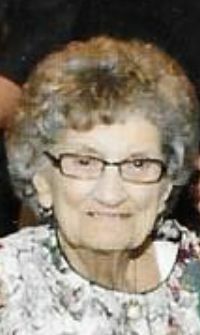 Rosemarie Sisson, 94, of Geneseo, died Monday, January 14, 2019, at Hillcrest Home, rural Geneseo. Cremation has been accorded and a memorial service will be held at 1:00 p.m. Thursday, January 17th, at the Cambridge Chapel of Stackhouse-Moore Funeral & Cremation Services. Rev. Jim Aniol will officiate. Interment will be in Rosedale Cemetery, Cambridge. Visitation will be from noon to 1:00 p.m. Thursday at the funeral home. Memorials may be made to the Rosemarie Sisson Memorial Fund. Rosemarie Moulton was born September 20, 1924 in Kewanee, the daughter of William A. and Elizabeth F.
Golden Moulton. She was educated in Kewanee area schools. Her marriage to Amos Sisson took place on September 7, 1947 in Kewanee. The couple lived in Cambridge until 1962 when they moved to East Moline. He passed away April 3, 1999. She was a homemaker and enjoyed her family. Those surviving are her grandchildren, Chris Cordell, Brookfield, MO, Jeffery (Nancy) Smith, Blytheville, SC, Angela (Matt) Eads, Leesville, SC, Matthew (Grace) Sisson, East Moline, Joseph Sisson, Colona, and a daughter-in-law, Judy Howell, Cleveland, GA. Other survivors include ten great grandchildren, two great great grandchildren, and a sister, Harriet Saey, Kewanee. Her parents, her husband, a daughter, Betty Jean Cordell, two sons, Bill Howell and Jerry Sisson, five sisters and four brothers preceded her in death. The family would like to thank the staff at Hillcrest Home and the Heartland Hospice for their excellent care.